Eating that bag of salty chips is satisfying, but it may affect your appearance. When you eat salty foods in excess, your body may retain water in an attempt to dilute it, which may make your face look puffy. In rare cases, a puffy face may be the cause of an underlying medical condition. Talk to your doctor before making any changes in your diet and before attempting to treat your puffy face yourself. Any food that tastes salty contains sodium -- but sodium is also used as a preservative in sweet and savory foods that don't taste salty at all. Although some sodium is essential for your body to balance fluids, help muscles contract and relax and send nerve impulses throughout the body, too much sodium is unhealthy. People 50 and under should eat 2,300 mg or less of sodium per day. Adults 51 and over should consume 1,500 mg of sodium or less per day. In order to balance out the sodium in your body, your body will hold onto extra fluid in an attempt to dilute the excess sodium. This may cause your face to look puffier than usual. A puffy face, also known as edema, may be a sign that you are consuming too much sodium. Sodium may also increase your blood pressure, which can cause kidney disease, a stroke, heart disease or heart failure. 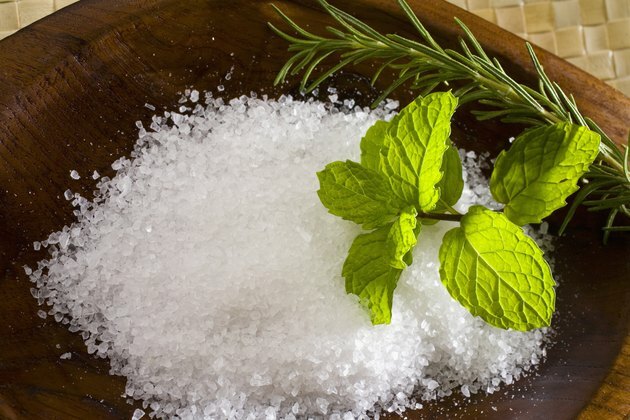 Eliminate face puffiness by reducing sodium in your diet. Check the nutrition labels of each food you eat and go easy on the salt shaker. When possible, opt for homemade foods instead of prepackaged foods that contain sodium as a preservative. Stay away from condiments that are high in salt, like dressings, soy sauce, mustard and ketchup. When cooking recipes, use half the amount of salt than what the recipe calls for. Although it may seem counterintuitive, drinking more water may help reduce water retention in the face. When you drink more water, you dilute the sodium in the bloodstream and your body does not need to hold on to so much excess water. Sleeping with your head elevated on an extra pillow and placing an ice pack on your cheeks may also drain the excess fluid out of your face.